For the finish coat of paint to achieve maximum coverage and adhesion, at least one coat of a primer paint should be applied to the surface prior to the top coat. Oil-based paints frequently require "thinning" to reduce their viscosity, or thickness, to improve flow and shorten drying time. If primer requires thinning prior to application, the paint can be mixed with a commercially prepared paint thinner made up of petroleum distillates. 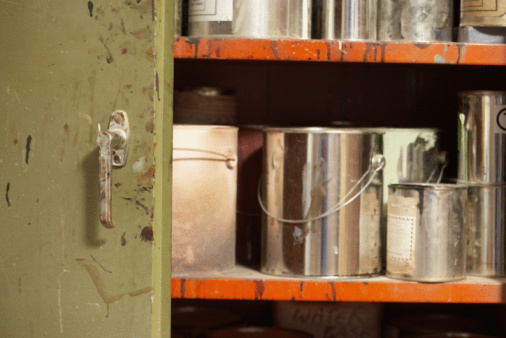 Thinning paint to reduce its viscosity can produce a smoother finish. Pour the primer paint into a mixing container. Stir the primer with a mixing stick until it reaches a uniform consistency. Measure the thinner with a measuring cup. Thin primer for spray applications on automotive-type finishes according to the paint manufacturer's specific reduction instructions. For spray applications on construction or home projects, begin by reducing the primer by 10 percent. This would call for adding approximately 3 oz. of paint thinner to each quart of primer (32 oz. x 0.10 = 3.2 oz. ), or roughly 13 oz. of thinner per gallon of primer (128 oz. x 0.10 = 12.8 oz.). Fill a spray gun with the reduced primer, and spray the primer on a test surface. If the paint shows any signs of clumping, reduce the primer by an additional 5 percent. Test the consistency of the primer, before thinning, for brush or roller applications. Brush a small amount of primer on a piece of cardboard. If the paintbrush marks fail to level out or disappear within a few seconds of application, thin the primer by 5 percent and retest the paint. Continue reducing the paint, in 5 percent increments, and retesting until the primer reaches the proper consistency. Nathan "Guide" Fisher began writing in 1997. A pilot and avid outdoorsman, Fisher has written articles on aviation and outdoor recreation, and produced marketing materials for “The Great Outdoors NETWORK!” Fisher holds bachelor's degrees in psychology and health, as well as a master’s degree in family studies.